Having a cat is a lot of fun and stress at the same time, especially is you’re a single lady. Unlike dogs, cats love freedom, quiet time and they tend to control their owners. You can’t just play with your feline friend whenever you want. Sometimes you can’t even guess what to do in order to make your cat a bit friendlier. I’m not talking about ordinary, stray cats who are loyal, lovely and friendly. 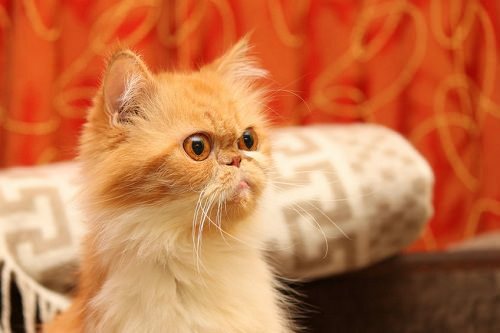 I’m talking about those cute but stubborn purebred cats who are not as simple as you think. Here’s what your cat thinks of you in different situation. Be careful and don’t hurt yourself smiling too wide! 1. I’m a queen here! Whether you’re exhausted, tired and stressed, or you just want to spend a few hours watching TV, your couch is always busy when you want to use it. You know your cat usually sleeps in your bed, but right now she’s lying on your couch and doesn’t even think of leaving it. You want to share that couch with her, but she gets angry and you end up sitting near the couch and watching TV while your feline friend is lying on your own and favorite couch like a queen. Saturday. 4 a.m. You wake up feeling those little feet running over you. Don’t scream, ladies! Your cat is just checking out whether you are alive and not late for work. Lovely cat, isn’t it? My kitty is like an alarm clock. She wakes me up at the same time each day. It’s so nice of her, but I wish she slept a bit longer on weekends. Cats aren’t huge fans of water. Every time you want to bathe your cat, you spend minutes looking for her. She knows when to play hide-and-seek. The minute you think of bathing your cat, start seeking! When you are running late for an important meeting or you are waiting for your guests, your cat can’t just sleep peacefully. The last moment you recognize that foul odor. Surprise! Now you have to change that litter again. 5. Wow, it’s a play time! When cleaning your house, you cat can’t sit motionless as well. Your kitty doesn’t anything possible to help you. The only thing is that your cat thinks you just play with her. My cat is always here to make a mess once my room is cleaned to perfection, gosh. Cats are selfish, not all of them, but most. When you cry, your kitty doesn’t understand why you’re crying when you have a cozy home, tasty food and lots of other amazing things. “You’re so miserable and ungrateful,” that’s what she’s trying to tell you. So smile and play with your little furry friend to boost your mood. When you are super happy, you jump, dance, sing and do many other things that make you more happier. If you kitty is sleeping at that moment, now you are selfish. Be sure, she will play you back for it! This is the thought your cat has when you are trying to feed her some unhealthy or disgusting stuff. Your kitty deserves only the best and most delicious foods. Keep it in mind next time you buy that cheap dry cat food. Your vacuum cleaner is your cat’s nemesis. In general, cats are afraid of any sort of loud noise. So now you know how to occupy your couch, or simply get rid of your cat for a while. But don’t forget that cats are unforgiving. If you are working from home, your cat is a big distraction. She is like a baby. She wants to eat. She wants to drink. She wants to play. She broke your favorite vase. Now she’s trying to catch your golden fish. Oh, that litter has awful odor. It seems you never accomplish your work. Now that you have some free time, you definitely want to tease your furry friend. Call it Murphy’s law, but your cat isn’t in the mood to play. The only thing you can do is leave her alone. Can you do it? I don’t think so. Every time your cat bites or scratches you, she doesn’t feel guilty. She thinks you really deserve it. You touch her in a sensitive area, tease her and do whatever you want, so your smart cat knows how to stop you. If you are a single lady who lives with a cat only, your cat can’t share you with no one else. Cats are jealous so tell your boyfriend to stay away from your cat, otherwise she can bite him too. Cats are incredibly curious. They like to sit and look out the window. It’s like a TV for us. But here you are wanting to kiss your sweet little friend. Let’s imagine. You’re going to watch your favorite show, but your neighbor wants to drink tea with you. What’s your reaction? Whether you have a boy or a girl, your cat definitely has most of these thoughts. It doesn’t mean your feline friend doesn’t love you. Cats show affection very differently than people do. Tell us more about your kitty.